Item is 100% UNTESTED. Selling As-Is, For Parts, For Repair, Broken, Damaged, Salvage, etc. May be missing parts (seen or unseen). Check pictures. “The Moog Micromoog is a one-oscillator (plus sub-oscillator) classic Moog monosynth from the ’70s. 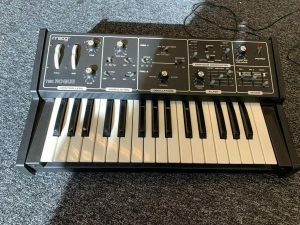 It is capable of the classic “beefy” Moog basses and typical Moog synth “whistles”, but also of a lot more. It features a very cool routable S&H circuit that one can even use to simulate an arpeggiator or a sequencer, and many other modulation & routing options that make this little synth very versatile. If you’re looking for “crazy” synth sounds you will also find them in abundance here. It was a budget unit, so the overall construction might not be as “strong” as the Minimoog, but it’s still fairly strong, and it is very portable. 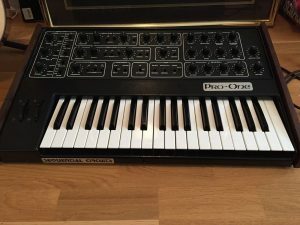 It features a ribbon controller instead of the more customary pitch wheel, while it does retain the usual Moog modulation wheel, which you can use to control several parameters. 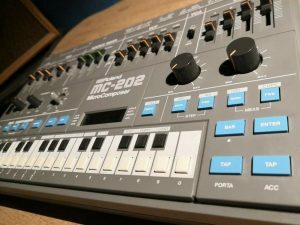 “Roland MC-202 MicroComposer SH-101 Analogue Mono Synth And Sequencer. This MC-202 is in stunning near mint condition. There is one small smudge on the front and a few light marks on the base apart from that it looks unused. Everything is working as it should. Very rare to find in such good condition. 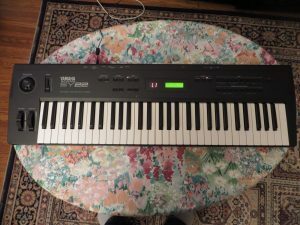 “DX7II-FD in as close to perfect cosmetic & working condition as I’ve seen on Ebay or elsewhere. No case damage, scratches, worn paint, broken keys, defective switches, etc. (well, there are a few scratches on the bottom). Any white specs in the photos are dust. Numeric displays have all segments working; no LCD defects or scratches. The only item not working correctly is the floppy drive. It reacts to commands, appears to work, but action ends in a Read/Write error. I will include a number of 720kb used floppy disks in case you figure out how to get it working. 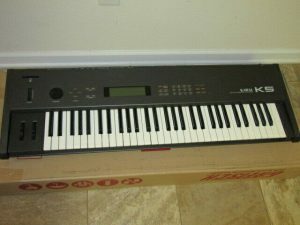 “Korg Poly-61 in excellent working order. I purchased this a month ago (I can send you the listing if you like, or just look up completed listings) but I honestly don’t have the space for it and I need the money. The keys are all working fine but may need a contact clean in the future. The Midi, Switches, Sliders and Controls function correctly and have been tested by our engineer. “A beautiful piece of 80’s synth goodness! This is the last full-analog monosynth Yamaha ever made before the digital revolution. If you want vintage fat bass sounds and leads, this is it. 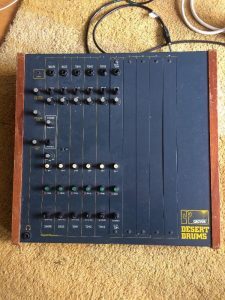 “100% functional, amazing-sounding Roland Juno 60 with MD-8 MIDI-DCB converter box to allow you to use it as a MIDI controller or send MIDI to it from another synth or a DAW. Comes with DCB cable and power cables for both the MD-8 and the J-60. Owned this for several years, kept in my smoke-free studio. Will be shipped with LOTS of bubblewrap in a HUGE box so it arrives with no damage to you! 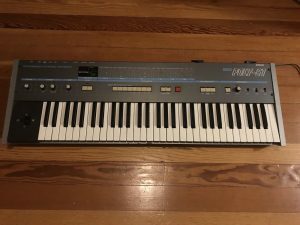 “Rather rare Yamaha SY-22 in very good condition. 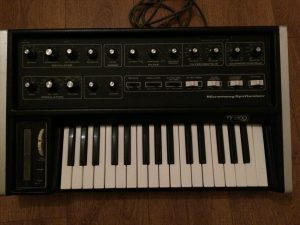 — This synth is capable of some really complextextures, due to its unique synthesis engine partly derived from the legendarySequential Circuits Prophet VS.
— Great for TV or film soundtrack work and ambientelectronics, the Yamaha SY22 has been used by both Moby and Skinny Puppy. — It has a full-size 61-key keyboard with velocityand aftertouch, is eight parts multi-timbral, and incorporates a small effectssection with 16 digital delays and reverbs. 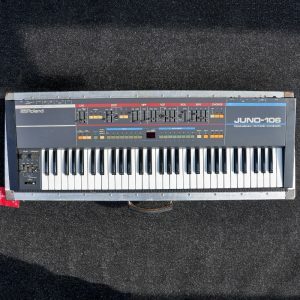 “This is Roland Juno 106. This is totally original condition including VCF/VCA chips. Working without problems, very good condition ! 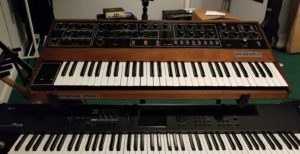 “It is with a heavy heart that i thin out my studio by starting with an Alesis Andromeda A6 polyphonic analogue synthesizer that is in excellent condition. 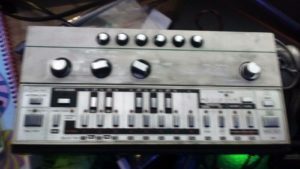 This synth was purchased new in 2009 from Noisebug out of Pomona CA. 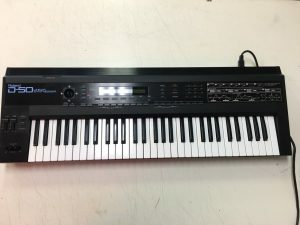 I have been the only owner and it has spent all of it’s time in a studio in an upper rack where it was mostly played through a master keyboard. I never had any issues with this synthesizer. It has been my berlin school in a box. 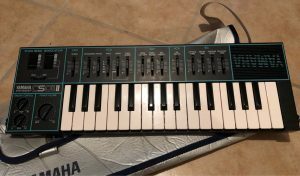 The synth has suffered a few minor cosmetic blemishes over the years as is identified in the close up pictures provided. It is due for a new battery at the end of 2019. The pots were recently cleaned. I am a non smoker. 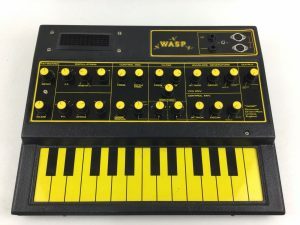 There is a steep learning curve with this synth to figure out it’s sweet spots so this synth would be best served with someone who has an excellent sense of programming. i admit, this synth humbled me at first. I deeply hope that this synthesizer finds a good home as it has served me extremely well. 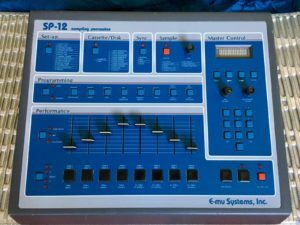 “Emu SP12 Turbo 2.6, Brought back to like new condition by Bruce Forat in LA in January 2016, used sparingly in my smoke free home studio triggered by another machine. 8 new audio outputs added, sample pot replaced and pcb traces repaired, all new numeric pad buttons replaced, pads replaced/reconditioned as needed, new battery, Noritake fluorescent display added, vinyl repro faceplate with small printing error (no start lettering under start button). 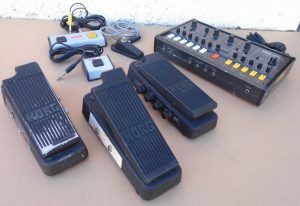 “Classic analog synth with amazing fat leads, lush pads and filter sweeps from early-mid 1980s, with MIDI, comes with hard case. Synth has some scratches and dings on body and wooden end pieces (see pics) which you would expect from a 30+ year old keyboard. The high A key was cracked but repaired and fully functional, just shows some discoloration where it was glued (see pic). I installed a brand new membrane keypad and LED display (an item that original component frequently fails on this model) about 15 years ago. Now operational, better than original. Sequencer appears to work, has a program in there from a previous owner, but I’ve never really fiddled with it to verify its functionality. 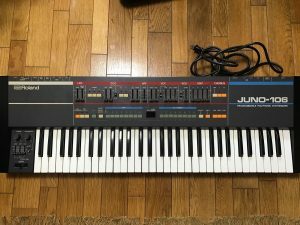 Uncategorized @ 01 January 2018, Comments Off on What is Synthfind? Very little else gets me excited than synths. Like many other Web sites, www.synthfind.com makes use of log files. The information inside the log files includes internet protocol ( IP ) addresses, type of browser, Internet Service Provider ( ISP ), date/time stamp, referring/exit pages, and number of clicks to analyze trends, administer the site, track user’s movement around the site, and gather demographic information. IP addresses, and other such information are not linked to any information that is personally identifiable. www.synthfind.com has no access to or control over these cookies that are used by third-party advertisers. 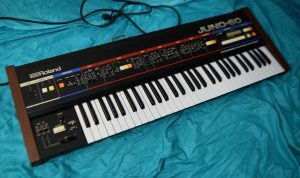 “Here is a Roland JX-3P in very good condition. There are a few minor scratches/blemishes, but plays perfectly. 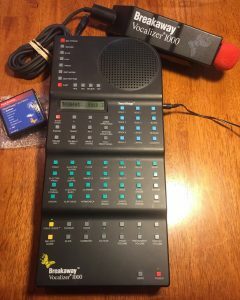 “Early J-Wire model in excellent condition. Recently serviced. Fully functioning. Bought new in 1981. One owner. Always kept in a smoke-free and pet-free environment. 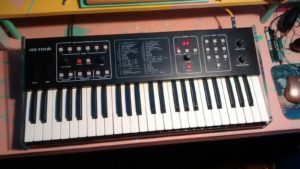 Outstanding vintage monophonic analogue synthesizer from the early 1980s. Two oscillators. Amazing filter. Two envelope shapers. Big, unique sound. Extensive modulation and cross-modulation possibilities. Two 20 step sequencers with real-time transposition from keyboard. There is no other synthesizer like it. With original box and manual … both now a bit shabby (see photos). 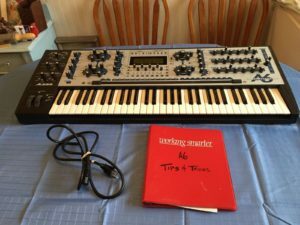 “Up for sale or best offer is 1 Korg EX-800 Programmable Polyphonic Synthe Module. This synth is in good working order. It does not have the original power supply. I powered it with an after market supply for testing. All buttons and pots are in working order. Missing: 1 Cover for Batteries. Added Feature: I modded the SH-101 to use it’s internal waveforms (noise, sawtooth etc) to modulate the cutoff frequencies of the filter. This can be turned On and OFF (off is functionally the same as an sh-101). This is an awesome mod, it creates much crazier sounds and FX.